Welcome to Write Right, I’m Aubrey and today we’ll be discussing prepositions. So what is a preposition? Prepositions are words in a phrase used to explain the relationship between words in a sentence. For example, in the sentence “Charlie went to the bank,” ‘to’ is a preposition. To, combined with, the bank forms a prepositional phrase. The preposition ‘to’ functions as a bridge between “Charlie went” and “the bank,” clarifying where Charlie went. Prepositions often clarify relationships such as time, location, or direction. Let’s start with prepositions that express time. For example, “Julie fell asleep at 10 pm,” here ‘at’ expresses exactly what time of day Julie fell asleep. ‘In’ expresses periods of time such as hours, days, months, seasons, and years. When time functions as a space of time in which one can reside, use the preposition ‘in.’ Our example this time is: “Jane and Bob always go skiing in March.” ‘In’ clarifies what month Jane and Bob went skiing in. Finally, ‘on’ can be used to describe days of the week or specific dates, for example, “On Saturday, Luke ran a marathon.” ‘On’ expresses the day of the week that Luke ran his marathon. Prepositions can also be used to express extended time. The most common prepositions that express extended time are: ‘since,’ ‘for,’ ‘by,’ ‘from’ used with to, ‘from’ used with until, ‘during’, and ‘within.’ Starting with “since,” let’s take a look at what these prepositions and an example of how each preposition can be used. ‘Since’ expresses an action or state that was happening or is still happening. 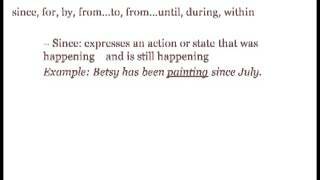 For example, “Betsy has been painting since July.” Betsy started painting in July and is still painting now. ‘For’ expresses the duration of an action or event. In this sentence, “Jim is going to Vienna for three weeks.” Jim will be in Vienna for a time period of three weeks, so “for” is appropriate. ‘From’ expresses the beginning and end of a time period. For example, “He will be studying from 5pm to 11pm.” So if your prepositional phrase clarifies a noun or action with a definite beginning and end, ‘from’ paired with ‘to’ or ‘from’ paired with ‘until’ are appropriate. Let’s look at ‘during’ next. ‘During’ expresses a period of time over which an even occurs. Here with the sentence, “Linda did her homework during the afternoon,” the time period is the afternoon. And lastly within. Within is used to show that something will take place before a certain or within an allotted time. In the example, “Harry will be moving within a year,” Harry will move before one year from now and in the second sentence, “Rose will finish her paper” between the current time and the end of one hour. Thanks for listening to Write Right, we’ll see you next time.